As Federal Judge Linda Reade read aloud his unimaginably cruel sentence of 27 years, which at his age amounted to life in prison, anyone else would have sunken into despair. 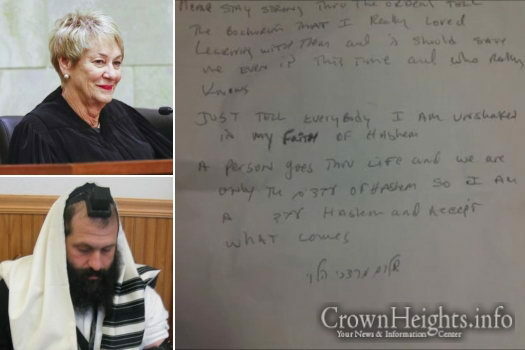 But Sholom Mordechai Rubashkin is a man of unshakable faith, and during what were meant to be his last few minutes as a free man, he scribbled this remarkable note to his family. Please stay strong through the ordeal. Tell the bochrim that I really loved learning with them, and Hashem should save me even in this time, and who really knows? Just tell everybody I am unshaken in my faith of Hashem. 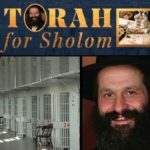 A person goes through life, and we are only the avodim of Hashem, so I am an eved of Hashem and accept what comes. This judge is gonna rot under gehonim. Shes a filthy anti semetic animal. Disgusting. I AGREE WITH YOU 1,000 %!!! Most all Goyim don’t go to gehenim, sorry. She’ll rot there with the worst punishment Gehennim has forever and ever, but she should also suffer horribly in this world. I wish for her to live to 120 – at least but should suffer a massive stroke and Yitzy H. In his good natured style should pass on to her his entire illness and walk awa a healthy man. It was during the conviction. Not the sentencing. to 6 and 7 well said, well said!!! !